Taiwan's culture, folklore, superstitions, environment and unique charms leap off the pages of two new books published by a group of expatriates, who delved into tales of ghosts, romance and urban mysteries to bring their local experiences to life for English-speaking readers. 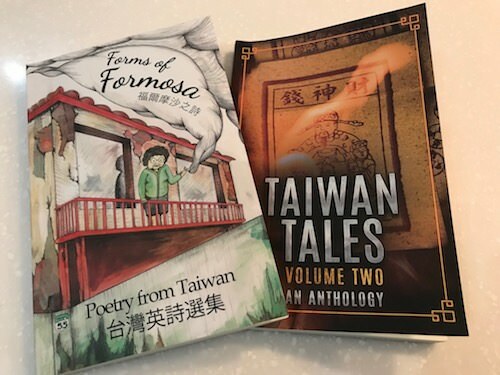 The two books -- an anthology called "Forms of Formosa: Poetry from Taiwan" and a collection of short stories titled "Taiwan Tales Volume Two" -- were published last month by the Taipei Writers Group, an organization of expats and Taiwanese nationals from all walks of life. "Taiwan Tales Volume Two" consists of seven fictional stories set in Taiwan and features tales ranging from a hotel ghost story and a dog's bildungsroman to an underworld odyssey. Pat Woods, one of the writers, said his story "Room 602" was inspired by the traditional Taiwanese custom of knocking on hotel room doors before entering to show respect for the "ghosts" inside. In the story, a Taiwanese woman encounters a ghost in her hotel room in Kaohsiung after failing to follow the custom of knocking first. Woods, who is from Nottingham, England, told CNA he was most intrigued by the perception among some Taiwanese of a close link between the real world and the ghost world, which was no longer a common notion in his home country. "In the past, there were many superstitions like this (in the U.K.), like leaving a bowl of milk out at night for the fairies, but they've all died out," he said. "I find Taiwan fascinating as there are these really modern cities and technological development existing side by side with traditional customs," said Woods, who works for a local ESL magazine and textbook publishing company and has lived in Taiwan for almost 10 years. In another phantom tale, Joshua J. Goodwin, a writer and English teacher in Taiwan, created a fantasy world of deities and mythical creatures drawn from Asian folklore. The story, titled "Underworld," follows a student who gets lost in a hidden world below Taipei City and who must brave encounters with gods, ghosts and living fairy tale characters to get back to school in time for an exam. Goodwin told CNA he was inspired to write the story after listening to English author Neil Gaiman's radio drama "Neverwhere." "I instantly fell in love with the idea of a zany, magical world roiling beneath the streets of a city," he said. "With its mix of old and new, strong local folklore, and numerous temples, which stand as living beacons of legend, myth, the mystical and the magical, Taipei was a perfect candidate for a story of my own." One of the places that his protagonist visits, "The Ever-Night Market," was drawn from the bustling night markets in Taiwan, while the red lanterns that appear in the story were inspired by his many night outings to the mountain town of Jiufen, the Australian said. Goodwin's writings also appear in "Forms of Formosa," which consists of some 70 poems about food and drink, flora and fauna, people and animals, and life in Taiwan. Living in the countryside in Nantou County where he has a view from his house of a bamboo plantation, Goodwin said, he gets inspiration for much of his poetry from the natural world and from tending local plants and animals. For an expat writer, living in a foreign culture offers limitless opportunities for growth, and opportunities to introduce that culture to people around the world, he said. "As a writer, I have the opportunity of bringing local culture and experiences to English-speaking audiences in other countries and perhaps for some of those people, it is their first brush with the local culture," he said. "That idea excites me." For Pat Woods, meanwhile, being a long-term expat means that he can really get to know another culture. "You're likely to have some stories to tell about your experiences and some observations about the things you've seen, and just as importantly, you'll have a better understanding of cultures different from your own," he said. CK Hugo Chung, convener of the Taipei Writers Group and a Taiwanese poet whose work appears in "Forms of Formosa," said the poetry collection is unique because "everyone provides distinctive takes on what it really means to live here." Chung, who launched his writing career while living in New York City, said he has always admired expat poets in the U.S. who could blend English with their native languages. Therefore, he said, he also tried to combine two languages -- Chinese and English-- in his bilingual poems such as "Nocturnal Democracy," which was inspired by the 2014 Sunflower Student Movement. Established in 2010, the Taipei Writers Group describes itself as an organization of writers interested in furthering their craft and passionate about the art of writing. Its members meet every other Sunday at a coffee shop in downtown Taipei to share experiences and give feedback on each other's poetry, short stories, novels, screenplays and blogs. The group's previous publications include "Taiwan Tales," which consists of eight short stories about Taiwan; "Night Market," a collection of stories inspired by Taiwan's night markets; "Peak Heat," an anthology of dystopian stories; and "Twisted Fairy Tales," a collection that features a blend of original fables and retold classic stories. Chung said his group is dedicated to developing homegrown English literature. 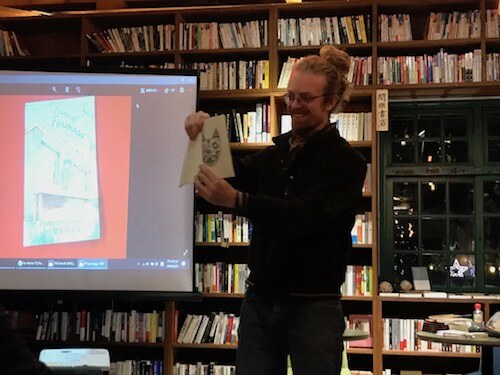 "Our main goal is to connect Taiwan to the international communities through literature, one anthology at a time," he said.